Heien v. North Carolina: As the rest of the country worries about police overreach, the Supreme Court gives cops yet more latitude. As the rest of the country worries about police overreach, the justices give cops yet more latitude. 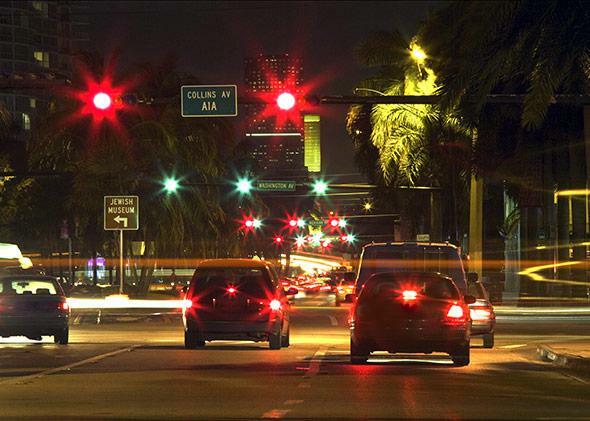 The Supreme Court ruled that although a police officer stopped a car for having only one working brake light, which was legal, the stop was “reasonable” under the Fourth Amendment. Monday morning, the Supreme Court handed down an 8–1 ruling in a case that appeared on the surface to resolve the arcane question of how many rear “stop lamps” (in the parlance of an antiquated traffic statute) need to be working on a carriage on a North Carolina highway. In reality, the new ruling is crucially important if not particularly illuminating, adding yet another layer of ambiguity about the boundaries on policing at precisely the moment in which more ambiguity is what we don’t need. Heien v. North Carolina was the first big criminal case to come down this term, and it involved a question of whether a cop’s mistaken understanding of a state traffic law—a misunderstanding that led to a traffic stop for wholly innocent behavior—should be used to throw out a drug conviction that resulted from that stop. On Monday, eight justices ruled that although the police officer stopped a car for having only one working brake light, and having only one working brake light is actually legal in North Carolina, the stop was “reasonable” under the Fourth Amendment. Thus, the baggie of cocaine the officer found in his resulting search of the car was admissible in court. Here’s what happened, according to the officer’s own testimony at the suppression hearing. Early one morning in 2009, Nicholas Heien and Maynor Javier Vasquez were driving down I-77 through Surry County, North Carolina. Vasquez was driving while Heien napped in the back seat. Officer Matt Darisse of the Surry County Sheriff’s Department was “observing traffic on the interstate” in order to “look for criminal indicators of drivers [and] passengers” when he noticed Vasquez driving by. Vasquez’s “criminal indicators” were that he looked “stiff and nervous” to the officer, insofar as he was “gripping the steering wheel at a 10 and 2 position, looking straight ahead.” Darisse decided to follow him. When Darisse noted one of the rear brake lights wasn’t working, he pulled the car over, mistakenly believing that state law requires two working tail lights. He gave the driver a citation, got permission to search the car from Heien, and eventually found a baggie of cocaine. Heien was sentenced to two consecutive prison terms of 10 to 12 months for drug trafficking. Why does any of this matter? Because Vasquez wasn’t stopped by the cops for having a broken tail light. He was trailed by an officer because he was driving while looking “stiff and nervous” and for “gripping the steering wheel at a 10 and 2 position, looking straight ahead.” In other words, he was a Hispanic man driving a beat-up car in North Carolina, and the officer followed him for doing what the rest of us do every single day: driving while holding on to a steering wheel and looking forward. Montgomery was unbothered by that fact that Vasquez was doing nothing wrong when he was stopped, responding to Sotomayor that “wholly innocent people are stopped quite often for mistakes of fact. … There turns out times that citizens have not committed any kind of offense, and yet they are stopped.” Then Roberts changed the subject. You would think that we had not just lived through a summer in which we were painfully reminded of the realities of militarized police, civil asset forfeiture, racial profiling, relentless police harassment of citizens, and frivolous stops for trivial infractions. These infractions can lead to mounting debts which in many minority communities turn the criminal justice system into something like a series of debtors’ prisons. The discussion in Heien never reflects the fact that a long, sordid history of pretextual and harassing traffic stops have fostered fear and anxiety in minority communities. As President Obama put it, there is a “simmering distrust that exists between too many police departments and too many communities of color.” But from the perspective of the high court, it’s as if the summer of 2014 was happening in an alternate universe. As ThinkProgress reported in August, the Bureau of Justice Statistics reported that 13 percent of black people and 10 percent of white people in their survey reported that their most recent contact with police had been during traffic stops. Seven percent of black drivers were ticketed, compared with 5 percent for white drivers. A brief filed in this case by the Rutherford Institute argued that allowing police yet more latitude in their interpretation of the law will disparately harm minorities, because their evidence shows that blacks and Hispanics are more likely than whites to be searched. But from the court, silence. This decision barely even acknowledges that, by giving police officers license going forward to claim that they were confused about this law or that law, there will be even more distrust and error. It is unclear based on the majority opinion and the concurrence by Justice Elena Kagan how much more actual confusion will be infused into daily policing. Time will tell, I suppose. But the fact that police will now likely be encouraged to choose the broadest possible range of plausible readings of any traffic law seems like the worst possible outcome at a moment when police overreach, particularly in poor and minority communities, is such a pressing issue. Sotomayor took a lot of heat for injecting personal discussions of race into last year’s affirmative action decision out of Michigan, and it’s clear that she feels the need to be careful when she talks about matters of race that are obvious to most Americans yet apparently invisible to the court. So what she barely hints at in Heien is something transparently true to anyone who’s been paying attention in 2014: Changing the rules around police encounters and pretextual traffic stops will surely affect poor and minority citizens in ways the justices seem unwilling to fathom.